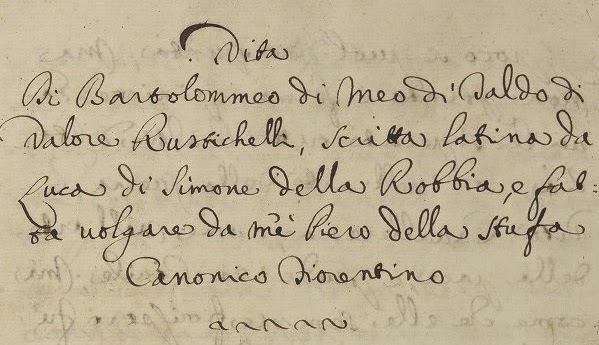 Opening lines of Piero della Stufa’s MS.
Translating Luca della Robbia from Latin to Italian. In early seventeenth century Florence, the honor and responsibilities of being a child's godparent was a serious affair. There were the ceremonial aspects of taking part in the baptism, but that was just the beginning. A godparent pledged responsibility to the Church for overseeing the spiritual upbringing of their charge. Beyond the realm of religion, they later brought a child into the family’s web of social, business and political contacts. In the family of Neri Neri and Dianora Parenti, there were ten children. 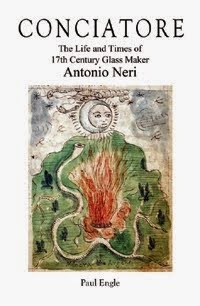 Their fourth child, Antonio, would go on to write the first book devoted to glassmaking formulas called L'Arte Vetraria. Each sibling with one, two or even three named godparents, made in total a list of eighteen family associates. These eighteen had families of their own, and soon the list becomes formidable. The genealogy is interesting; many of these families are intermarried, and a number of the godparents are related directly or have common family ties. However, even glossing over these specifics, a remarkable aspect of the list emerges that demands notice. This is the striking prominence of the names; almost all of the Neri godparents are known to history. They were lawyers, bankers, politicians, ambassadors, courtiers and high church officials. Continuing where we left off, Francesco Neri was the third child. Francesco's only godparent was Giovanni Acciaiuoli. He was from one of the two influential banking families that managed the Tuscan treasury for Grand Duke Cosimo I. Giovanni had been one of five special administrators charged with the construction of the new seat of the Medici government, the Uffizi palace, on the banks of the Arno River. Antonio Neri's godparents were Francesco Lenzone and Ginevra Sassetti. Lenzone was a Florentine lawyer and notary like Dianora's father. By 1590, he was ambassador to Spain for Ferdinando I. The wealthy Sassetti family was part of the early Medici banking empire. In the sixteenth century, the family continued as close allies of the Medici. They ran a trading operation within India through Pisa and Lisbon. Ginevra's nephew, Filippo Sassetti, was a correspondent with the circle of friends to which Antonio's father belonged. He sent medicinal samples back to Florence from his base in Goa India. Loyalist Jacopo di Alamanno Salviati (1537-1586) enlisted as the godparent of Jacopo, the Neri's second son so named. He was both friend and first cousin to Cosimo I. He was also the first cousin of Alessandro Ottaviano de' Medici, who at the time was Bishop of Pistoia and later rose to Archbishop of Florence. He would go on to become a Cardinal, and in 1605, his peers elected him pope, taking the name Leo XI. Appearing in the register as godfather for Antonio's younger brother Vincenzio was Piero della Stufa, a church canon. The Della Stufa family has a long and venerable history in service to the Medici. Piero translated a book from Latin written a century earlier by famed sculptor Luca della Robbia. In 1570, the same year that Antonio's parents were married, he was named as will executor and administrator to the estate of mannerist sculptor Benvenuto Cellini. Other members of the Della Stufa family had come to the legal and financial aid of the colorful and somewhat volatile sculptor at various times in his life. Cellini himself wrote a book on goldsmithing and sculpture, in which he devotes a chapter to the art of enameling. He does not give specific recipes, but he does discuss transparent gold ruby enamel and the procedure for ‘striking’ the fabled color in the furnace. Striking is the special reheating process required to bring out the deep ruby red color. Neri would later discuss red enamel in letters to his friend Emanuel Ximenes and ultimately publish a short recipe for gold ruby glass in his own book. 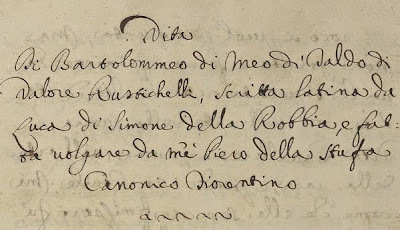 There is no indication if Neri was familiar with Cellini's 1568 publication, but this is entirely possible, especially in light of the family connection. * This post first appeared here on 18 April 2014.